This product has been discontinued and replaced by P0744S/L. β-N-Acetylglucosaminidase is a highly specific exoglycosidase that catalyzes the hydrolysis of terminal, non-reducing β-N-Acetylglucosamine residues from oligosaccharides. 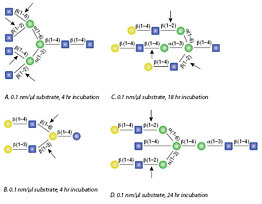 Specificity can vary depending on incubation time and branching structure. 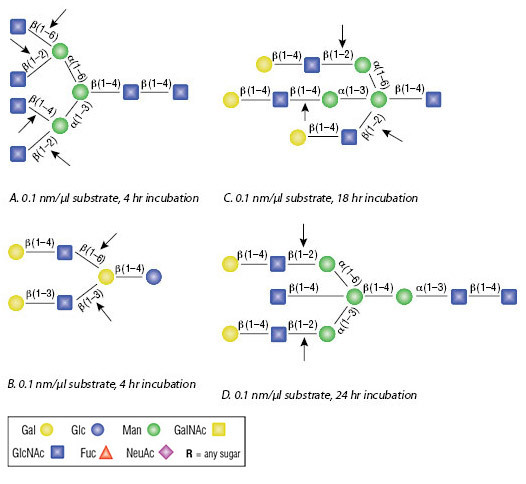 All reactions contained 4 units of β-N-Acetylglucosaminidase, 1X GlycoBuffer 1 and 1X BSA in a total reaction volume of 10 µl. Reactions (B), (C) and (D) were treated with 8 units of β1-4 Galactosidase prior to treatment with β-N-Acetylglucosaminidase to form the above substrates. Reactions were incubated at 37°C. Epigenetics applications: O-GlcNAc (N-Acetylglucosamine attached to serine or threonine) is a regulator of nuclear protein function. N-Acetylglucosaminidase removes O-GlcNAc from transcription factors, histones, RNA-binding proteins, etc. One unit is defined as the amount of enzyme required to cleave > 95% of the terminal, non-reducing β-N-Acetylglucosamine from 1 nmol GlcNAcβ1-4GlcNAcβ1-4GlcNAc-7-amino-4-methyl-coumarin (AMC), in 1 hour at 37°C in a total reaction volume of 10 µl. Unit Definition Assay: Two fold serial dilutions of β-N-Acetylglucosaminidase are incubated with 1 nmol AMC-labeled substrate in 1X GlycoBuffer 1, supplemented with 100 µg/ml BSA, in a 10 µl reaction. The reaction mix is incubated for 1 hour at 37°C. Separation of reaction products are visualized via thin layer chromatography (3). Recommended storage temperature is 4°C. Guthrie, E.P., Shimer, E.P. New England Biolabs, unpublished observations. Magnelli, P.E., et al. (2011). Methods Mol. Biol. 801, 189-211. Can I use β-N-Acetylglucosaminidase in a double digest with other exoglycosidases and/or endoglycosidases? What is the difference between β-N-Acetylglucosaminidase and β-N-Acetylhexosaminidasef? What is a good positive control for β-N-Acetylglucosaminidase? Using 1-2 µl is a good starting point for a 1 hr incubation of 1µg of glycoprotein or 100 nM of oligosaccharide.